Safari Ltd Toobs have arrived at Battlefield Legends Toy Soldiers! 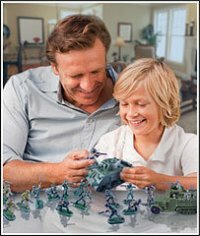 These classic action packed toobs will delight the imagination of any toy soldier collector. 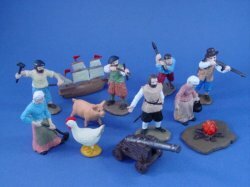 Set includes: Sailor with Navigational Device, Blacksmith, Settler with Musket, John Smith, Female Settler Gardening, Female Settler Cooking and Settler Workman with Ax. All Safari products are phthalate-free and safety tested. 100% satisfaction guarantee. Shop with confidence!